No Phun against the Phillies! 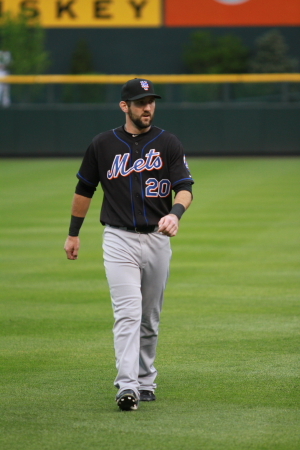 Eric Young Jr. 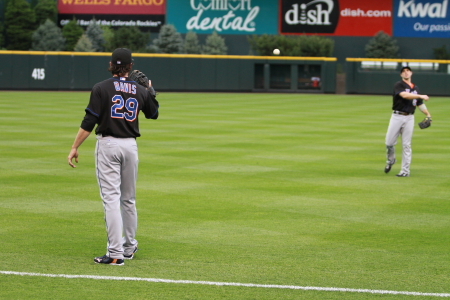 Throwing to Dexter Fowler. Cole Hamels Pitched for the Phillies and Jhoulys Chacin started for the Rox. Jhoulys Chacin throwing the first pitch to The Phillies Jimmy Rollins. Rollins and Shane Victorino Both grounded out. 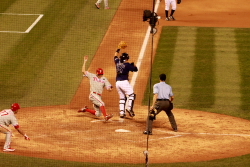 Chase Utley was walked and Ryan Howard Flew out to end the inning. The Rockies went down in order in the Second. Cole Hamel pitching in the 1st inning. 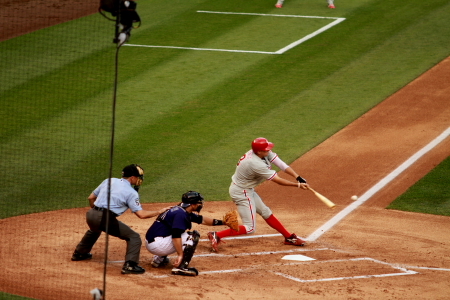 Hunter Pence at bat in the 2nd inning. he lead off the inning with a fly ball to center. Hunter Pence at bat in the 2nd inning. He lead off the inning with a fly ball to center.He was just traded from the Astros. Chacin also walked a batter in the 2nd Raul Ibanez. The Phillies would not score in the inning. Chacin threw 29 pitches in the first 2 innings. 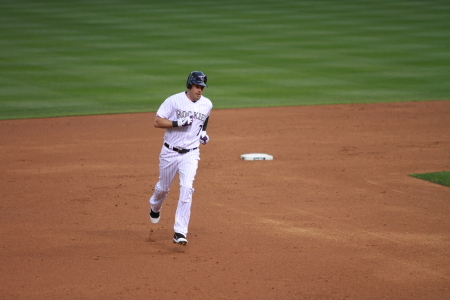 Seth Smith running to home after his 2nd inning HR. 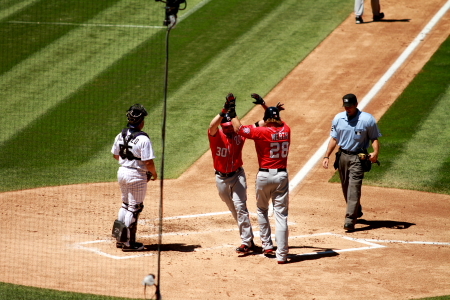 Shane Victorio being called out after being tagged out by Chris Iannetta. 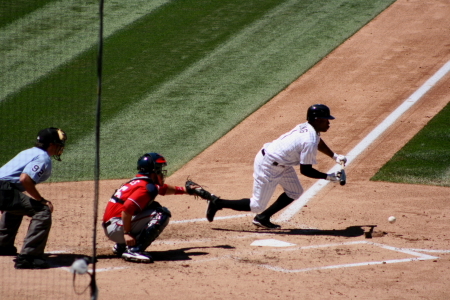 The Deuce swinging wildly to foul off the pitch in the 5th inning. He would later Strike out in the at bat for the third out of the inning. In the Inning Ellis struck out for the second out. Both Ellis and Tulowitzki came up with the bases loaded. This was a situation that all they needed was a base hit for 2 runs and were swinging for the fences. I know Tulo wants to be the hero but striking out is not going to produce. I am still not familiar with Ellis swing but I know when Tulo is swinging for the fence instead of getting a hit. He defiantly was not looking for the single which would score a run or 2 which can always be needed for this team the way they have been playing of late. These runs would be very significant in the later innings. Bob Apodaca comes out to talk to Chacin in the 7th inning. 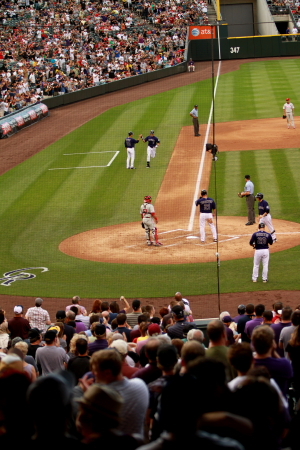 Chris Iannetta crosses the plate after his 7th inning lead off HR. Chacin remained in the game and grounded out for the 1st out. Young pop out to the catcher. Fowler would walk than be caught stealing at second with Ellis at the plate for the 3rd out of the inning. 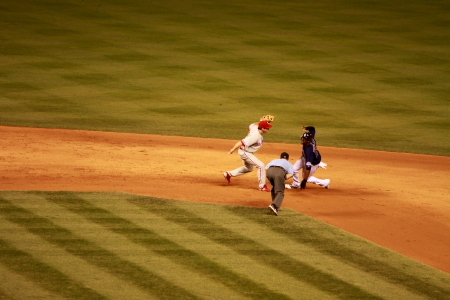 Fowler being caught at 2nd to end the 7th inning. Ty Wiggington giving Chacin some props as he left the game in the 8th. 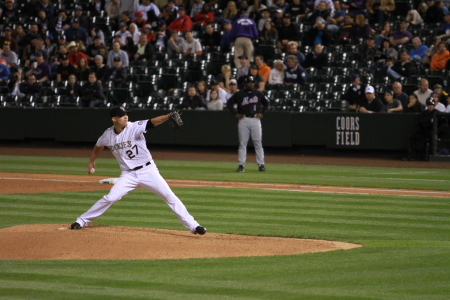 Chacin once again pitched well striking out to letting up 5 hits and 1 run. walking 2. He threw 101 pitches. Matt Reynolds would come in to pitch to Utley and Howard. Rafael Betancourt would finish the inning. Rafael Betancourt striking out Pence to end the 8th. 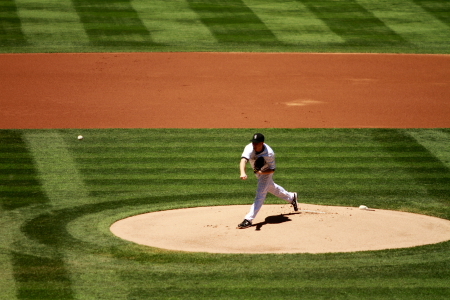 Huston Street warming up before the 9th inning. The Rockies went into the 9th with a 3-1 lead and looked like they had the game. Huston Street would strike out Ibanez and Placido Polanco would fly out to Dex in center. street would need one strike to also K Carlos Ruiz. Ruiz would hit a double and then John Mayberry would hit a 2 run HR to tie the game in the 9th. Rollins would strike out to end the inning, Remeber those significant runs back in the 5th. 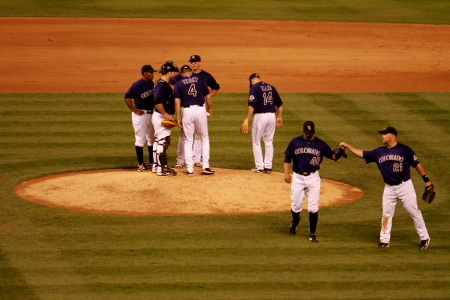 That would have been the game either 4-3 or 5-3 for a Rockies win to start of the series against the Phillies. But that was not the case. The game is tied in the 9th. 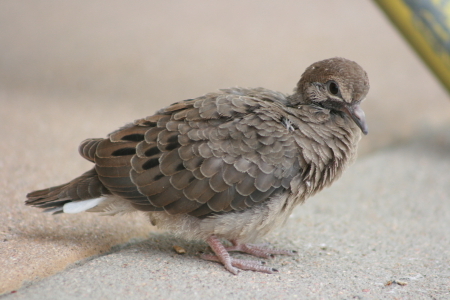 Smith would lead off the 9th with a single. The next 2 batters would go down in order in the 9th. 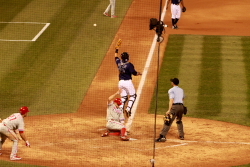 John Mayberry hitting the tieing HR in the 9th inning. So the game headed to extra innings. 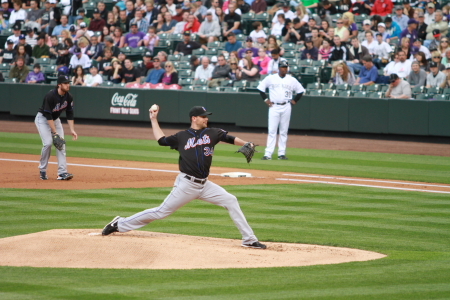 Rex Brothers pitched in the 10th. Shane Victorino would lead off with a solo shot to make the score 4-3 Phillies. 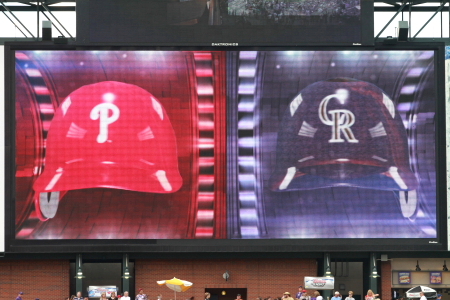 That’s all that was need for the Phillies the Rox came up in the 10th and went down in order to end the game. 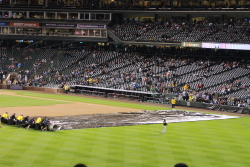 The game looked promising but end on a series of bad pitches and luck for the Rockies. So how important were those runs that did not happen in the 5th, I would say very. I will be at the next 2 in the series. See Ya at Coors. All Photos in this post are property of the Rox Addict Blog and MCS Photography any reproduction of any kind is illegal. Oddly enough I do take a new one of these for each game. This is a view from the concource for the line for a Ubaldo Jimenez autograph. I got both my bobbleheads signed by Ubaldo. Starting Pitcher for the Rockies Alan Johnson. The odd thing is usually the crowd will cheer and applaud when the starter emerges from the dugout. Not today he just took the long walk out with out acknowledgment. I think I may of been the only person who knew who he was. Alan was in the Springs last year and I have seen him pitch before. I also believe I have his autograph somewhere. 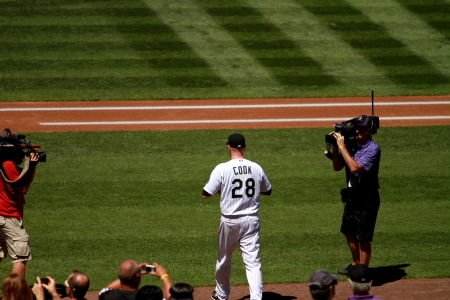 The Coors crowd will know who he is soon enough. Alan Johnson long throwing with Jose Morales in the outfield. This was Alans first major league start. Alan Johnson warming up in the bullpen. 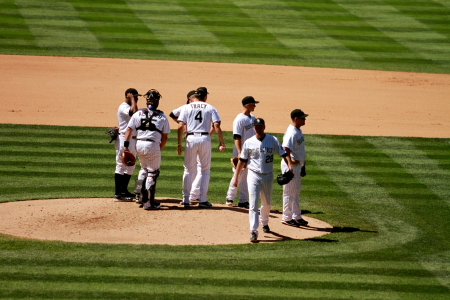 Rockies starters stretching on the first baseline before the game. 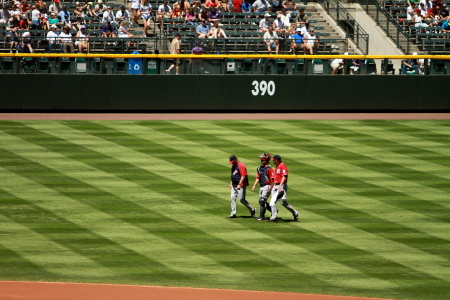 Alan Johnson and Jose Morales heading from the bullpen. 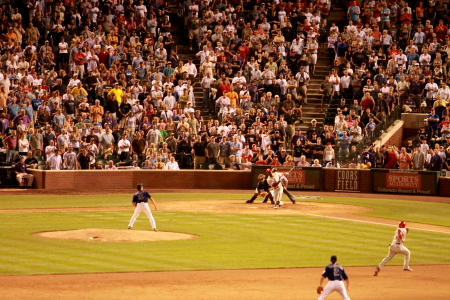 Johnson Throwing his first big league pitch to the Cubs Starlin Castro for a strike. Nice way to start a MLB career. Castro would end up hiting a single and scoring the first run of the game off of a Darwin Barney single. 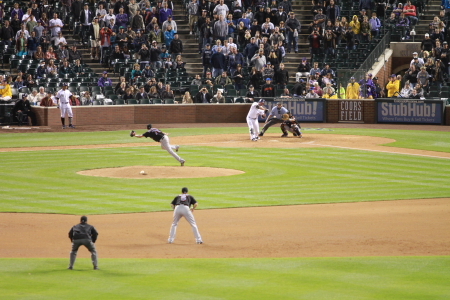 The Rox would double up the Cubs on a hit by Byrd to The Deuce for a double play getting Barney at 2nd and Byrd at 1st. Ramirez would the ground out to end the inning. 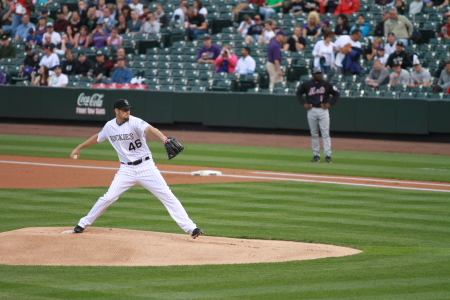 The Rockies would give Johnson some run support in the bottom half of the 1st. After Fowlers lead of strikout. 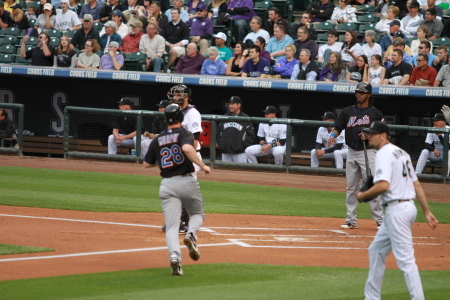 Cubs starter Ryan Dempster would then walk Jonny Herrera who scored on a Carlos Gonzalez double. Tying the game at 1-1 The deuce would then flyout to center Helton singled and Seth Smith hit a homerun for the Rockies to take a 4-1 lead. So the offence realy helped him with run support. 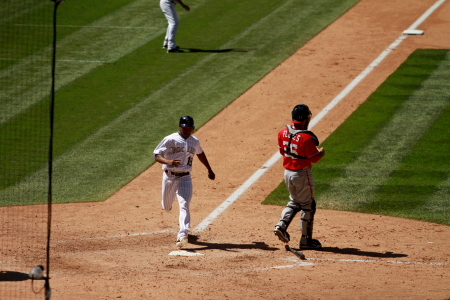 In the 2nd inning Johnson would walk the lead of batter for the inning Carlos Pena. Then he would get his first strikeout with the next batter Alfonso Soriano. The Cubs would score one hin the 2nd making it a 4-2 Rockies lead. The Cubs would go on to score 2 in the 3rd. and one in the 4th. tying the game at 5-5. 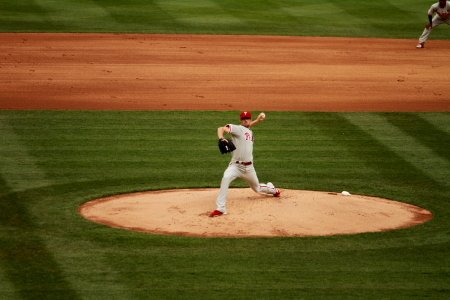 Johnson would pitch 4 innings with 3 strike outs, 3 walks (which all 3 would result in runs), throwing 93 pitches. Letting up 5 runs. Over all he did pitch well for a first start. Cubs Shortstop catches The Deuce pop up in the 3rd inning. The Deuce’s next homerun will be his 100th of his carrer as of the time I am writing this he has yet hit it. “D”, Lil Ranter Hunter, Allanah X and Gary X sitting in the front row of the Rockpile above the word solar. During the 6th inning I headed over to the section directly behind homeplate to take a few photos. The Rockies Then Rallied in the 8th 2 score 4 more runs sending 10 batters to the plate in the inning Smith singled Lopez doubled, Fowler and Herrera also doubled. All 3 outs were on strike outs Jose Morales, Ty wiggington and Spilli all K’d. 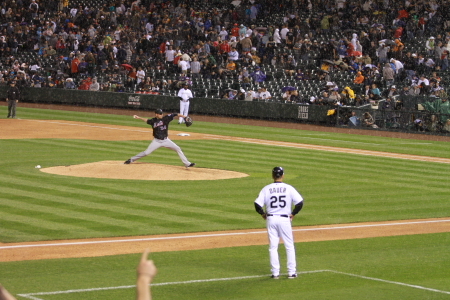 Rockies Manager takes the ball from Matt Reynolds in the top of the 8th. Rafael Betancourt would come into the game to pitch the rest of the inning. Jim Tracy handing over the ball to Betancourt. Rafael Betancourt getting ready to pitch. This photo was taken by my Mom who attended the game with me. This photo is to show where I get my mad photo skillz!! Ok maybe not but it was pretty good. 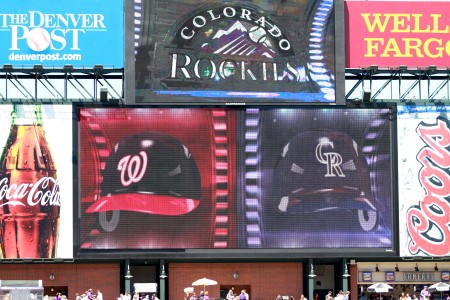 The scoreboard at Coors while the Rox were ralling in the 8th. Rockies outfielders celabrating the Rockies 9-5 victory over the Cubs. The Rockies are 12-3 on the season. The Post game celabration at the Root Sports Desk. I realy like this photo it has a bunch of The Rantics in it Judy is holding the Root, Root, Root for the Rockies sign my Mom is standing to the left of the sign and “D” and Hunter are standing in the top center to the right of the BIG L sign!!!!! Great day at the ballpark. A Rockies win and a Ubaldo Bobblehead. As I am writing this the Rockies have lost their second game in a row to the Giants. I did not attend either game. They are now 12-5 but still 2 games a head of the Giants in the West.Ian Stewart has been optioned to the Springs and Ubaldo made his first start since Opening Day. Unfortunatly it was also his first loss. An if you didn’t know who Alan Johnson is you do now. If you still don’t learn it!! 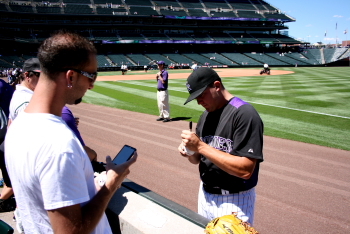 I will be at Coors for tomorrows day game against the Giants. Thats all I got see you at Coors!!!!! CHA-CHING, Rox Win & Someone Gets a Hit! After a shutout BP where I still have not caught a ball making me 0-3 games this season which is a slight slumb when snagin’. We then headed over to the 1st base line to see if we could get a auto or 2. I only got a Ryan Spilbourghs on a Ticket stub from a game last year that he Cargo and Seth Smith hit Back to Back to Back Homers against the Diamondbacks on May 27th. The L.A. Dodgers and Rockies this is the new LCD board under the Mountain Ranch Club. Jhoulys Chacin heading to the Bullpen for his start. Spilli signing autographs before the game. 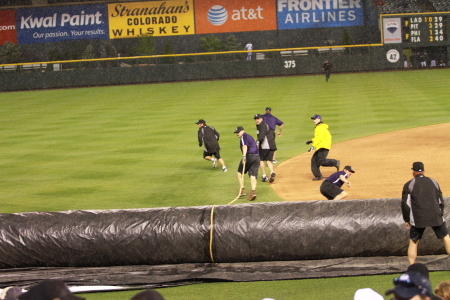 Here’s the Rockies taking the field against the Dodgers. Jhoulys throwing the first pitch to the Dodgers Rafael Furcal. furcal would go 0-4 this game grounding out at each at bat. Chacin pitched a really good game letting up 5 hits, striking out 3 holding the Dodgers to no runs in 7 innings. 2 of the strike outs were in the4th against Uribe and Barajas. Now normaly I would not post so many photos of one play but this is a double play in the second inning. The ball was hit by Uribe to Wiggington at third Lopez gets Loney out at second throws to Helton to get Uribe incredible play. Hey Rod Barajas, Remember that time you were a Met!! In the 4th someone finally got a hit ! After going 0-9 He hit a big one for a Homerun. 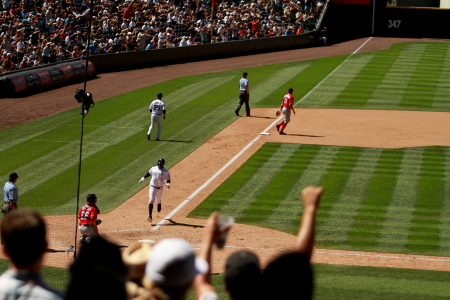 The Deuce Troy Tulowitzki rounding the bases after his 4th inning homerun. Which raised his batting avg. to .100 Whoooo Hoooo. The 4th inning Homerun by the Deuce was the first run of the game. 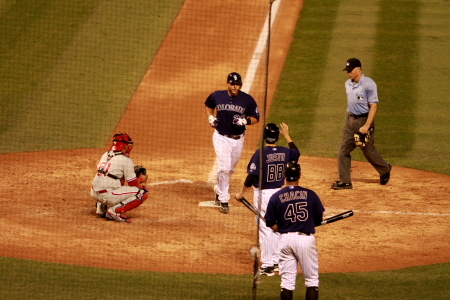 The Rox also scored a run in the 5th when Chris Iannetta also hit a solo Homerun. Then they went on to score in the 6th. 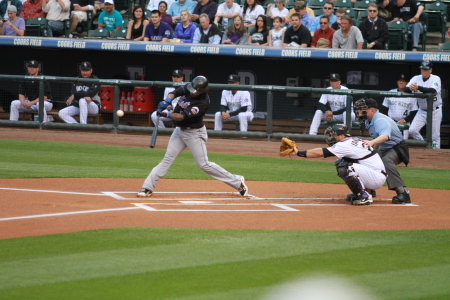 With Dex hitting a lead off 2b, he later scored on a Lopez single. making the score 3-0 Rockies. 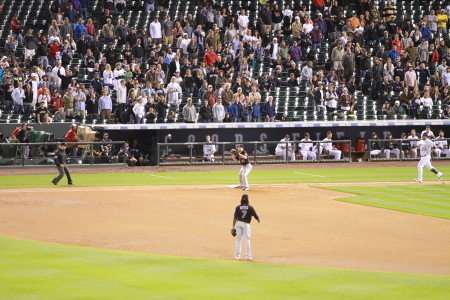 the Rockies after this game are now 2-1 for the 2011 season Jhoulys got the win and Street jith the save. 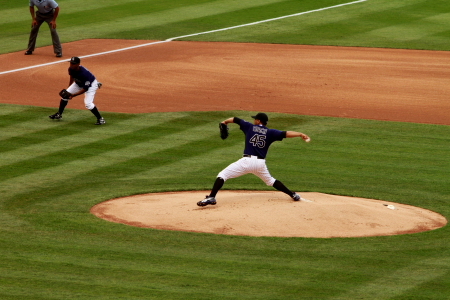 Huston Street pitching to the last batter of the game in the 9th inning. Much better pitching performance from Street this game 3up 3 down and he did it in under 15 pitches. Way to go Huston ! Like usually we headed over to the Root Sports post game desk to celabrate the victory. Tom Helmer, The Cowboy Tracy Ringolsby and George Frazier at the post game desk. Once again great night hangin with the Rantics @ Coors. Thanks to everyone who checked out the 5 additions of this post that were posted incomplete with out my knowing. Long Way to Go But it Ended with a Solo. My day Started with seeing a post from the Rockpile Ranter that he was first in line to enter the new stadium. 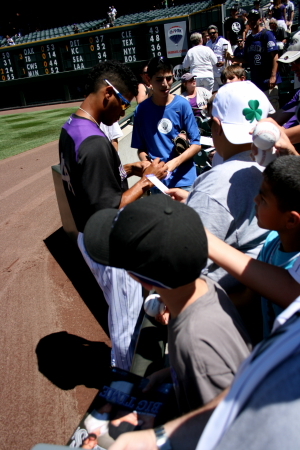 Later on there was a phone call from Robert saying he had not caught the first batting practice ball at Salt River Fields @ Talking Stick, But Did get the second that he caught from Troy Tulowitzki. An was the 1st Rockies fan to catch a BP home run. I was unable to get to Scottsdale for this game so I did watch the entire game from home on FSN soon to be Root Sports. During the whole game you were able to feel the excitement from phone call and post from friends that were there, to the chatter between a bunch of us before and during the game. Finally after months of watching the count down on The Salt River Fields @ Talking stick website. The time had come and a new Era for the Rockies has started. 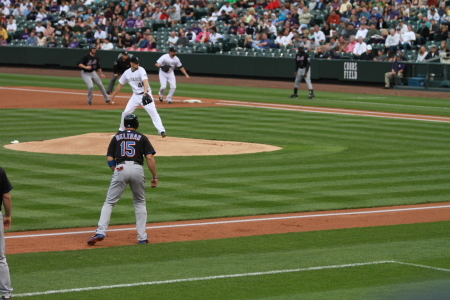 The First Pitch was thrown by Arizona’s Aaron Heilman to the Colorado Rockies center fielder Dexter Fowler. It was a taken strike. Then Dex hit along flyball to the Diamondbacks center fielder Chris Young. 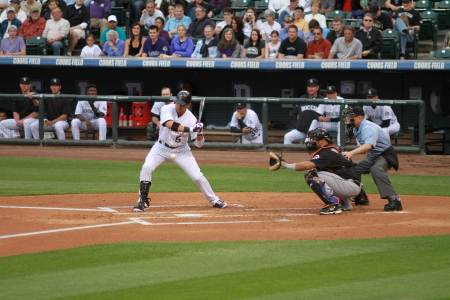 On another day it would have been a Home Run, even though it was an out for the Rockies.The crack of the bat said that baseball is back. After a quick 1,2,3 inning, that saw Seth Smith and Cargo both grounding out.The Rox took the field behind their Ace starting pitcher Ubaldo Jimenez. Ubaldos first pitch was a ball. He then walked Johnson. Parra got the first hit. After that, J.D. Drew hit into a double play, the first double play. Tulo to Lopez and then to Wiggington for the double play. The Rox came up in the 2nd. 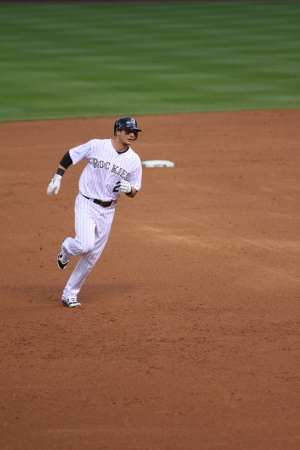 Another 3 up 3 down inning But Tulo had the Rox first hit for a single. 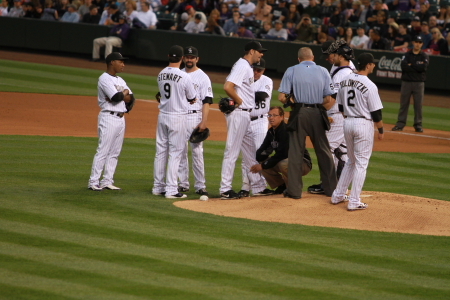 Then Ian Stewart hit into a double play getting Tulo out at 2nd and Stewart at 1st. Ty Wiggington made his Rockies debut with a pop out. Now to the D-Backs 2nd inning. where Geoff Blum flew out to Cargo an up came Pena who hit a single off of Ubaldo for the first hit in the history of Salt River Fields @ Talking Stick. The first run was scored off of the Rockies 2nd Pitcher of the day Gregg Reynolds, after the HR he really improved and pitched a very good 3rd and 4th with 2 strike outs and only a base hit allowed besides the HR. 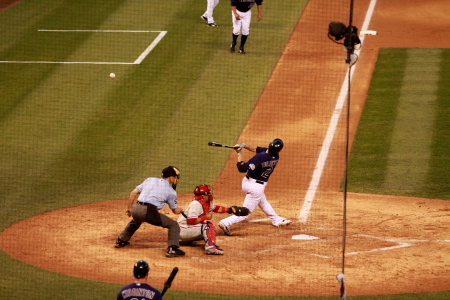 in the Rockies 4th the Rockies scored their first run when Cargo hit a single that scored Seth Smith from 2nd. 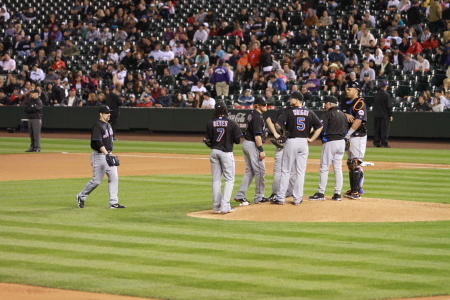 After the Rockies 3rd inning most of the Rockies starters left the game. It was time to see the minor league players prospects and invitees. One very notable performance was Jonny Herrera who went 3 for 3 with a walk. Their were no other runs till the Rockies 6th inning. When Sky Sox left fielder Cole Gardner hit a single with 1 out. Followed by a Pop out by Gomez and a walk by Chris Nelson then a double by Mike Jacobs scored them both, making the score 3 to 1 Rockies. In the Top of the 7th the Rockies scored 4 runs which they sent 9 batters to the plate. The Diamondbacks did respond in the 7th when Brandon Allen scored off of some bodies double (Trying to keep track of opposing teams with not very known players yielded to be difficult). The score at this point was 7-2. It looked like the game was well out of reach, BUT as many people know you never leave a game early and in baseball anything is possible and especially in spring training. The Diamondbacks came back in the 9th with 5 runs including a 3 run HR by invitee Paul Goldschmidt, tying the game at 7 a piece. The game went into the 10th inning. 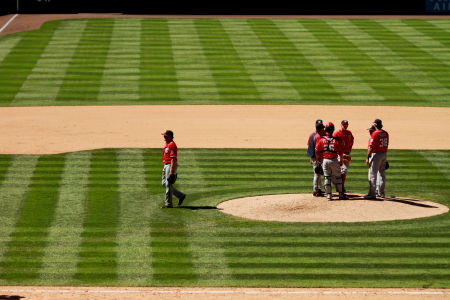 At first the Diamondbacks did not come out to the field thinking in Spring Training fashion the game would be called. Not in this one, they were going to the 10th, and, after a Mike Jacobs fly out to center Charlie Blackman came up with a long solo shot to the berm in right field. I was actually on the phone with Robert who was at the stadium and heard the homer over the phone before i saw it on the 7 second delay on TV. 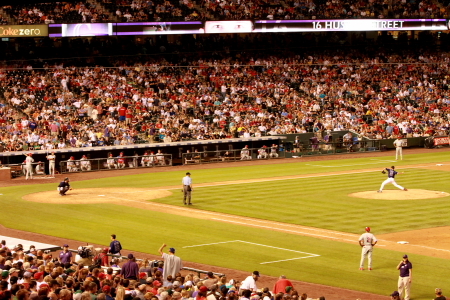 The D backs came up in the with an un productive inning and the Rockies won the game 8-7. Andrew Johnston Pitched very well in the 9th and 10th inning an even got an at bat for a walk in the 10th. So The game was a great first game for a new stadium. With exciting come backs and extra innings and was won in total Rockies style. 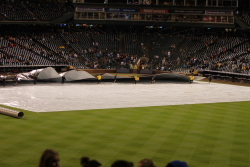 During the game FSN showed the new Rockies Commercials which as always were very entertaining. My favorite was the Metal detector which featured Troy Tulowitzki and Todd Helton. Even though I was not there it was fun and exciting to watch. Had a great time chatting with other Rockies fan who were also watching from their homes. Gary X, Joy and Dan. And hope this will be a frequent tradition during away games. 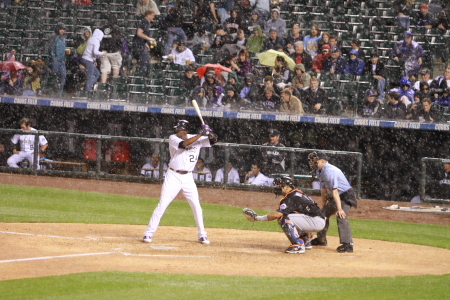 As I am writing this 9 News in Denver has reported that the Rockies Lost this game in 10 innings 8-7. Maybe they should watch the games or maybe even read one of the MLB Blogs. For More Coverage from this game Check out the Rockpile Rant baseballsnatcher.mlblogs.com who was their live and I’m sure will share the experience and photos from the game like only the Ranter can. 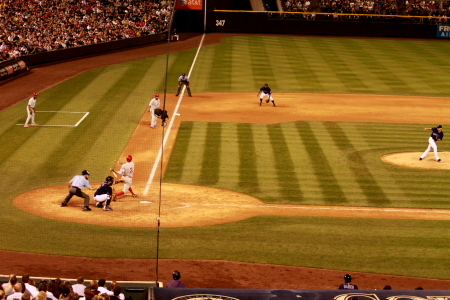 I can’t wait for my trip to Scottsdale on March 18th when I will be blogging nightly from the games at Salt River Field at Talking Stick and Rockies away games.